Washington, D.C. – In a stunning rebuke to President Obama’s warning of a veto, and the Saudi threat to attempt to crash the U.S. economy by selling off their U.S. holdings, the U.S. Senate unanimously approved legislation that would allow Americans to sue foreign governments for terrorist attacks committed on U.S. soil, according to The Hill. In an exceedingly rare moment, the Senate voted unanimously for the bipartisan “Justice Against Sponsors of Terrorism Act,” sponsored by John Cornyn and Chuck Shumer. The legislation now moves to the U.S. House of Representatives, which has its own version of the bill. The legislation had been held up by a known war-hawk, South Carolina Senator Lindsey Graham, citing concerns that it would potentially allow for foreign governments to follow suit – a harrowing prospect for a country that uses the CIA to foment revolutions across the globe. Over the recent congressional recess, Graham dropped the hold, according to The Hill. The bipartisan bill has ignited threats from the Saudi government and further strained already tense ties for the long-standing Petrodollar alliance between the U.S. and Saudi Arabia. As we reported previously, the Saudis have warned the Obama administration that if the bill becomes law, the Kingdom would sell off its U.S. treasury holdings in an attempt to crash the U.S. economy. In response, the White House made clear President Obama’s intention to veto the bill, which if passed would clear the way for families of victims of 9/11 to pursue lawsuits against Saudi Arabia in relation to the terrorist attacks. The bill faces opposition in the House of Representatives as well, with Speaker Paul Ryan leading the charge to stifle accountability for the perpetrators of 9/11. “I think we need to review it to make sure we are not making mistakes with our allies and we’re not catching people in this that shouldn’t be caught up in this,” Speaker of the House Paul Ryan said last month. 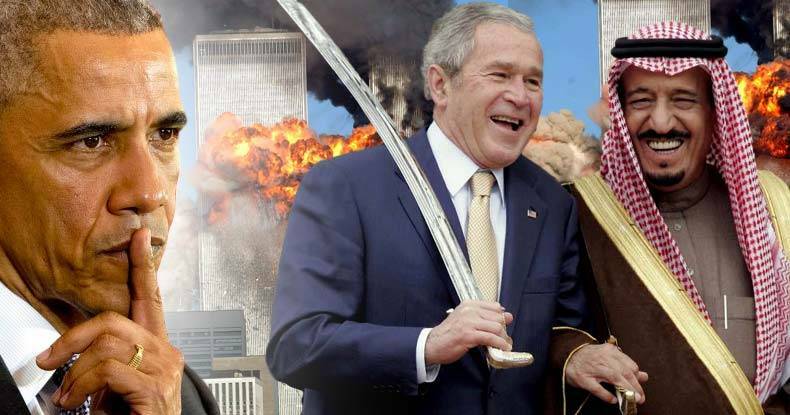 If passed, the legislation would allow for an exception to the sovereign immunity doctrine as established in 1976, which has protected the Saudi government from lawsuits relating to the 9/11 attacks. Citing sovereign immunity, a federal judge threw out a lawsuit by the 9/11 families against the kingdom in September 2015. Under the Cornyn-Schumer bill, however, Riyadh could be sued because the attacks on the World Trade Center and the Pentagon killed American citizens on US soil, according to a report by RT. Obama claims his opposition to the legislation is due to the potential legal risk it would pose to American citizens. “If we open up the possibility that individuals in the United States can routinely start suing other governments, then we are also opening up the United States to being continually sued by individuals in other countries,” Obama said in an interview with CBS News. Essentially, the U.S. government fears that their own global terrorist misdeeds, fomented by the CIA, will then be unmasked if there is a reciprocation by other nations — an almost unthinkable scenario for those in power.